Send a fabulous bouquet of bright white roses to a loved one. Our fresh flower bouquets of stunning white roses are guaranteed to make a statement. These magnificent flower arrangements would make ideal ‘Thank you’ flowers and create a chic display in any room. 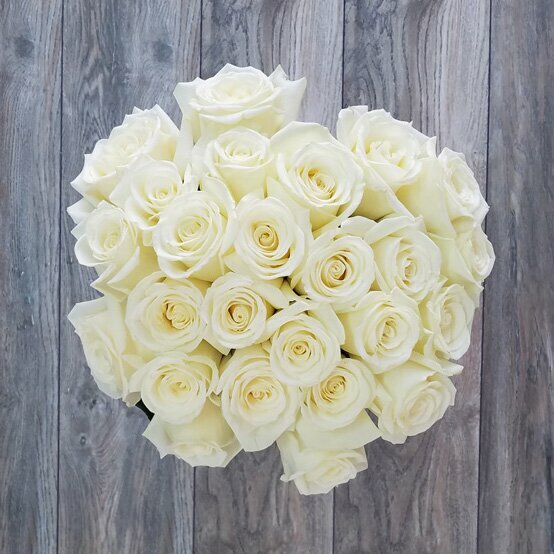 Our exquisite white rose bouquets are hand-picked and arranged by our professional florists so you can rest assured you are getting the freshest roses of the finest quality. There is a selection of fresh flower bouquets to choose from. 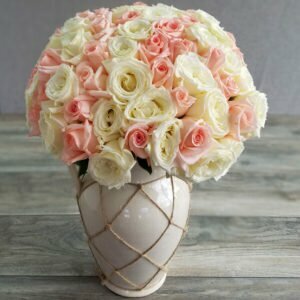 Send a traditional bouquet for a special occasion and impress your loved one with this classic arrangement. If that’s not to your taste, more contemporary flower arrangements are available so you can send the definitively chic gift. The white rose never goes out of style and white rose bouquets delivered by Mia Roses make a signature statement. 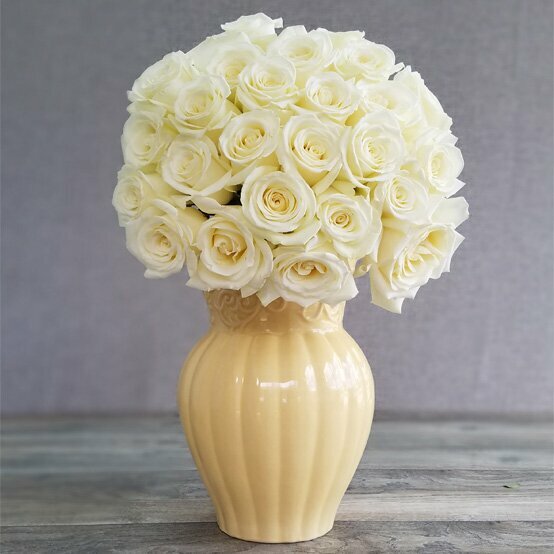 Our timeless white rose bouquets are the ideal way to show your gratitude. What a wonderful way to give thanks: with a bunch of bright white flowers, a token anyone would appreciate. You can even add a personalised ‘Thank you’ message to make your gift even more special. White roses make fantastic plant arrangements, which look stunning in any vase. Our luxurious flower bouquets are wrapped in special Mia Roses white paper and hand-tied with 2 top quality coloured ribbons, a beautiful contrast against the white flowers. Choose the colours you think your special someone would prefer. Add a personalised message printed on an elegant postcard for the definitive personal touch, making your gift truly unique. 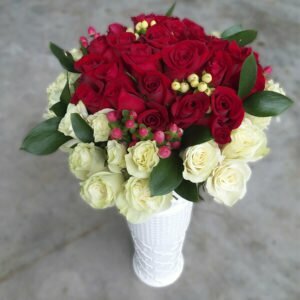 Send your contemporary flower arrangement or traditional bouquet today and get next day flower delivery! 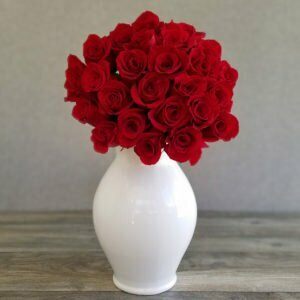 Thank You Flowers Delivered by Mia Roses means a hand to hand delivery service, where your bouquet of roses is delivered straight to your recipient’s door. Our delivery service means each bouquet is carefully packaged by our florists and delivered by specialist couriers, to ensure every flower remains of the highest quality. We offer same day and next day delivery, perfect for a spontaneous gesture. 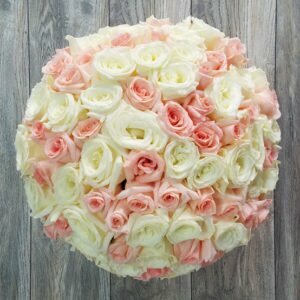 Roses delivery is available 7 days a week in Miami and surrounding areas. 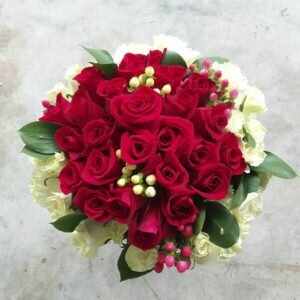 Send your fresh flowers bouquet today and select your delivery date. 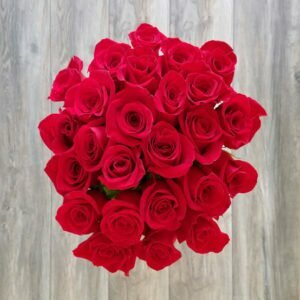 If you would like to send roses of a different colour, please see our selection of rose bouquets and send 100, 50 or 25 pink, yellow or red roses to someone special. All with next day flower delivery.